The Brownstones at Hyde Park/Tempe are located at 589 S Roosevelt Street, and run along 6th Street between Roosevelt and Wilson moments from Downtown Tempe inside the Riverside/Sunset neighborhood. 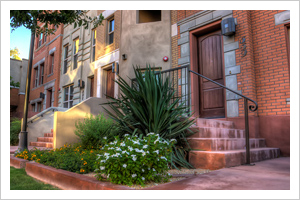 Originally coined, “The Brownstones at Hyde Park”, this conclave of of 65 urban brownstone style walk-up residences were designed by architects Roberts Jones & Associates for the developer Brownstone Residential (the firm also responsible for The Lofts at Orchidhouse in Downtown Tempe). Unfortunately, Brownstone Residential lost the property to foreclosure in 2003 and the development lay dormant for a few years. In 2005, Namwest Homes purchased the project and re-started construction and sales with the moniker, “The Brownstones at Tempe”. The majority of the Brownstones completed construction in 2006. Once again, developer Namwest fell victim to the Great Recession of 2008. After selling out over half the community, the remaining homes were left as vacant shells until purchased by an individual investor for a song. The new investor slowly sold the remaining Brownstones to the public over the following years until they were completely sold out. Today, this rare example of Tempe urban living come available for lease or for sale often. Blending Turn-of-the-Century exteriors with 21st Century interiors, the two and three-story Brownstone homes boast traditional brick and stone exterior facades with bay windows, harking back to the brownstones found in historic neighborhoods of Chicago. In fact, many Chicago brownstone neighborhoods were photographed and analyzed by the original architect for use as a template for the final design of the Brownstones at Hyde Park/Tempe. The Brownstones have much to offer any discerning urbanite. Garages are situated in the back of the homes with walk-up front entries to promote a friendly and welcoming neighborhood feel. Most homes feature either a front porch or a covered patio. Homes blend these classic exteriors with interiors that feature open floor plans and the conveniences of modern technology. Thirteen different floor plans are available, ranging from 976 to 2,557 square feet, with one, two or three bedrooms and attached 1 or 2 car garages. The residents at The Brownstones have some creative and exciting options. The “Concord” is a towering three-story home with a sitting area connected to the master suite by way of a catwalk. The “Lexington” – a three-story, two bedroom corner unit features a circular front porch. Perhaps the most original homes are the “Newberry”; these units have a second master suite atop a detached two-car garage and are connected to the home by an enclosed bridge. Examples like these makes The Brownstones at Hyde Park/Tempe truly one of kind! Located within walking distance of the Tempe FLASH bus route, within half-mile of the 3rd Street & Mill Avenue Metro light rail station, bustling Mill Avenue, and Tempe Town Lake.